Discussion in 'Sound City' started by neil_g, Oct 28, 2018. I've been using a SD-793II for the last 2 years to feed my powered Yamaha HS5 from PC Optical, it's done a brilliant job and sounded pretty good for the price point. However time has come for an upgrade, and I needed more power to run my new 660S. I'd already decided on a balanced setup as I'd already converted a lot of my headphones to 2.5mm to get the extra juice from my portable Fiio Q1mk2. I'd been scratching my head for some time regarding which route to go; Aune S6, Topping D7Xs, Schiit Jotunheim etc. But in the end it came down to budget. Enter the SU-8 and SAP-9 for less than £280 for both shipped..
SMSL info is pretty lacking, SAP-9 product page is minimal and the SU-8 does not even have a page, specs can be found on Amazon.. But love him or hate him I stumbled across Zeos reviews for both and they sounded like they'd do the job. So mainly for the lack of a long USB I'm running optical from my PC, set to 24bit/192kHz to the SU-8. Custom XLR cables from the lovely people at OIDIO SOUND into the SAP-9. My monitors are hanging off the SU-8 RCA (RCA to XLR cables). 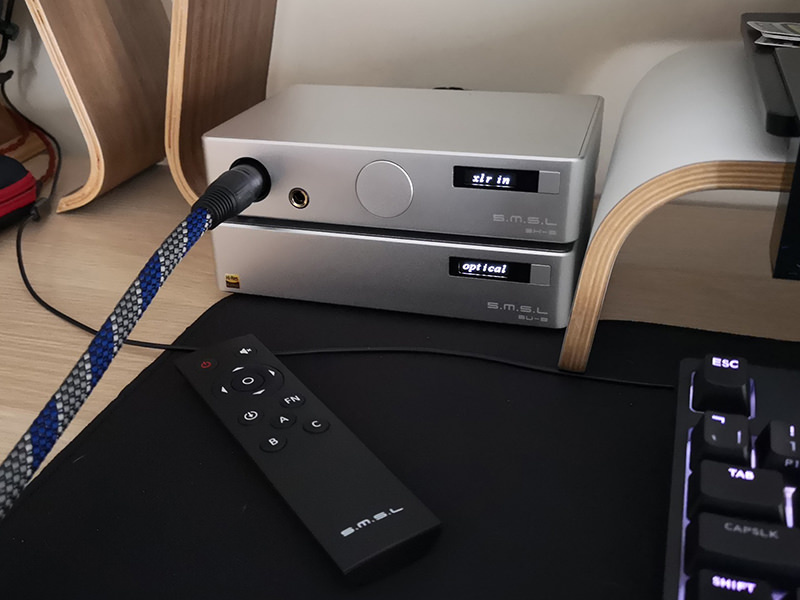 Sounds pretty good to me, the DAC out to the HS5 has a nice clarity in the detail and soundstage. The SAP-9 seems very capable, plenty of power for the 660S and I've not noticed any issues despite the mediocre THD figures. It does get a bit bright at very high volumes. It looks like there may be a matching Amp for the SU-8 "coming soon" (video 40s in the SH-8), might be one to keep an eye out for.. I picked up an M3 as a stop gap after having a few poor units of the fulla 2 in a row. And it's been so good for my needs it killed me looking for anything else! Superb little usb powered DAC amp and mostly used for gaming with pc and Xbox. i have an SD-793II and an A2 stereo amp. I cant really such much bad about either of them. Both low frills, both cheap and performance is solid especially for the price. They can certainly be improved on of course but not really for that money. They do make a mixed bag of kit. The cheaper stuff is definitely no frills. This su-8 dac though, very impressive. Found the matching sh-8 amp starting to appear in us and China. Debating importing one.. Sounds pretty nice to me. Loads of grunt running the 660S (DAC maxed, and 50-60% vol on the amp). Could this be the entry point to running balanced now? £189 for the SU-8 balanced DAC, £149 for the SH-8 balanced amp. Does anything else come close to that price point? The SU-8 is now shipping the V2 board too which fixes some distortion issues (although not "seen" that on my V1) and tests better than the Modi 3. Needs a catchy name though... SMSL Bal-Stack? Those SMSL units look very nice. I've got a Q5 Pro, which I've got hooked up to some floor standing speakers downstairs. The system doesn't get used that much, but the Q5 Pro does a great of powering the speakers; especially when it comes helping out the bottom end, which the speakers are otherwise a tad lacking.